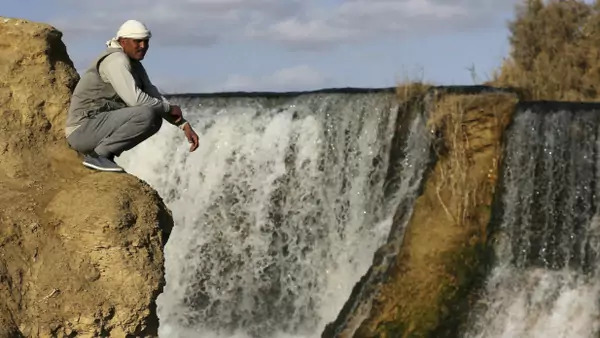 A man sits near the waterfall at Wadi El-Rayan in the Al Fayoum Governorate, southwest of Cairo, Egypt (Mohamed Abd El Ghany/Reuters). Reading selections for the weekend of March 31, 2017. Jacky Hugi reports on Oded Amit’s efforts to preserve the cultural heritage of the Jewish Iraqi language. Aya Fatima Chamseddine contends that the legacy of sectarianism and factionalism will limit the ability of Lebanon’s youth to break free of a pattern of political polarization. Ahmed Elderiny explores the link between jihadi activity in the Egyptian city of Fayoum in the 1990s and the formation of the self-declared Islamic State decades later.